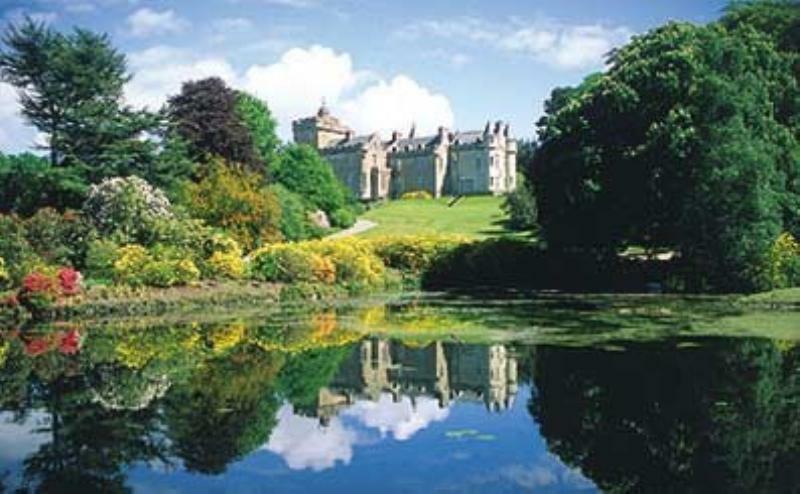 Built in the 1870s for the Deputy Lord Lieutenant of Ayrshire, this mighty castle is baronial exuberance personified, with turrets, castellated walls and glorious vistas overlooking the Irish Sea and Ailsa Craig. In 1994, current owners Graham and Fay Cowan embarked on a six-year restoration programme of the building and its 30 acres of grounds: the result is a vast country house hotel awash with lavish trappings, original features and two elegantly furnished dining rooms. Dinner is a fixed-price, five-course extravaganza that hits the heights and impresses with its sheer refinement and invention. The kitchen respects local produce, but the results on the plate are far from parochial: a mosaic of Ballantrae lobster is served with tomato coulis and lobster beignet, Isle of Arran langoustines and queen scallops are poached with lemongrass and ginger, while Scottish cheeses are served with garden rhubarb chutney and home-baked rosemary and raisin bread. Ravioli of braised ham hock with pea and smoked ham velouté is a typical starter, and desserts have included passion fruit and praline parfait with exotic fruits. French classics loom large on the prestigious wine list, which includes some fine offerings by the glass. Note that light meals may be provided for residents at lunchtime.